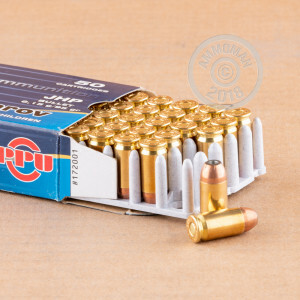 For an inexpensive 9mm Makarov defensive load, it's hard to beat this ammunition from Prvi Partizan of Serbia. These cartridges fire a 95 grain jacketed hollow point bullet. 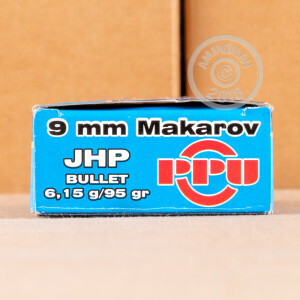 This ammo uses non-corrosive Boxer primers and brass cases and is manufactured in Uzice, Serbia. The 9x18 Makarov pistol cartridge was the Warsaw Pact analogue to the 9mm Parabellum round used by NATO forces. Though weaker than its Western counterpart, it is more powerful than the .380 ACP and more suitable for use in compact blowback-action pistols, most notably the Makarov PM pistol. Shop at AmmoMan.com for all your ammunition needs! Free shipping for all orders over $99 makes it easy and cheap to stock up on everything you want. Every other shell failed to fire. Firing a fairly new, CLEAN & OILED, Walther PPK/S and new ammo.